Harmonics-Group Nuremberg 2015 | Harmonik Zentrum Deutschland e.V. ◾Together with Johannes Kotschy, his remarks on natural note music were intensified at the Harmonik Symposium 2015 in Nuremberg. ◾The question was then asked how natural-tone music and images painted with natural colors can come together. For this purpose, the second movement “Passacaglia” (a variation movement) was first played from the composition “String Quartet No. 2” by Johannes Kotschy. Subsequently, the pictures “Gates to Eternity” by Angela Kandler Seegy were shown in a picture presentation. Finally, for each of the 7 images of the episode “Gates to Eternity”, the first 7 variations from the aforementioned Passacaglia were played individually. Afterwards, the shared experience of artistic image statement was discussed. This vote will now take place on the occasion of the Harmonics-Symposium 2015 on the evening of May 9. Afterwards, the lecture “From the Sound of the World” on 12th February in the meeting house ofSt. Jobst was discussed in retrospect. Finally, the program for the upcoming Harmonic Symposium 2015 in Nuremberg was discussed in Detail. 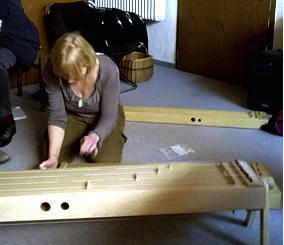 After the coffee break Ms. Baudenbacher came to hand over a newly built monochord to one of our harmonic-friends. This opportunity was used to demonstrate to us once more in detail the possibilities of playing music with the monochord by Ms. Baudenbacher. All harmonic-friends were involved. The status of preparations for the Harmonic Symposium 2015 in Nuremberg was discussed in the near future. Then Johannes Kotschy introduced us to a set of timelessly tuned sound tubes and explained his ideas for his lecture on natural note music at the coming Harmonic Symposium. Next topic Angelika Kandler Seegy presented examples of after-colors. Finally, Wilibald Limbrunner gave an overview on harmonically interpretable structures and figures in the English Rossly Chapel. Finally, in a review of the Harmonics-Symposium 2015, it was discussed how the concepts and ideas presented at the symposium can be used to provide food for thought for our further work. Holger Ullmann from Aschaffenburg visits us for the first time and talks about his work. His basic credo is: “Number Theory + Geometry = Philosophy”. By that he means the combination of the logical analytic way of thinking (numbers = quantities!) With the image-oriented intuitive observation (geometry) to a holistic, deep understanding (philosophy). With this he meets a basic concern of harmonics. Hans G. Weidinger presented his first thoughts on the next Harmonics-Symposium 2016 in Nuremberg for discussion. polygons as with numbers led. He clarified how one can arrive at complex geometric contexts with a harmonic background by studying polygons. Furthermore, Johannes Kotschy demonstrated on the piano how to trace the development of music from the original intervals octave, quinte from the beginnings of the prelude to Richard Wagner’s opera “Das Rheingold”. Finally, the interplay of image and music that was already presented at the meeting on July 11, 2015 was repeated. This time in the presence of both the composer Johannes Kotschy and the painter Angelika Kandler Seegy.